With the aid of the simultaneous diffraction of X-rays at large and small angles and the optical polarizing microscope, the influence of the gamma rays on the structure of lyotropic lamellar liquid crystals has been investigated. It is shown that the balance between the electrostatic repulsive and Van der Waals attractive forces changes in the lamella owing to the influence of these rays. This results in the changes of such parameters of the lamella structure, as its thickness, the partial area per one head of the phospholipid molecule, and the crystallization effect. As a result, the phospholipid bilayer is swollen and the microstresses arise. Russian Text © H.G. Badalyan, S.H. 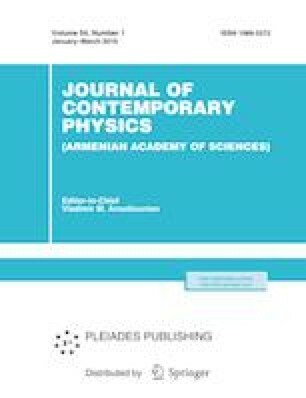 Faltajanyan, 2019, published in Izvestiya Natsional'noi Akademii Nauk Armenii, Fizika, 2019, Vol. 54, No. 1, pp. 85–92.